Since the best way to learn is to see an example, start by securing your application with HTTP Basic authentication. Symfony's security component is available as a standalone PHP library for use inside any PHP project. A standard Symfony distribution separates the security configuration into a separate file (e.g. app/config/security.yml). If you don't have a separate security file, you can put the configuration directly into your main config file (e.g. app/config/config.yml). Let's look briefly at how security works and how each part of the configuration comes into play. Symfony's security system works by determining who a user is (i.e. authentication) and then checking to see if that user should have access to a specific resource or URL. When a user makes a request to a URL that's protected by a firewall, the security system is activated. The job of the firewall is to determine whether or not the user needs to be authenticated, and if they do, to send a response back to the user initiating the authentication process. A firewall is activated when the URL of an incoming request matches the configured firewall's regular expression pattern config value. In this example, the pattern (^/) will match every incoming request. The fact that the firewall is activated does not mean, however, that the HTTP authentication username and password box is displayed for every URL. For example, any user can access /foo without being prompted to authenticate. This works first because the firewall allows anonymous users via the anonymous configuration parameter. In other words, the firewall doesn't require the user to fully authenticate immediately. And because no special role is needed to access /foo (under the access_control section), the request can be fulfilled without ever asking the user to authenticate. Like before, when the user originally makes the request, the firewall doesn't ask for any identification. 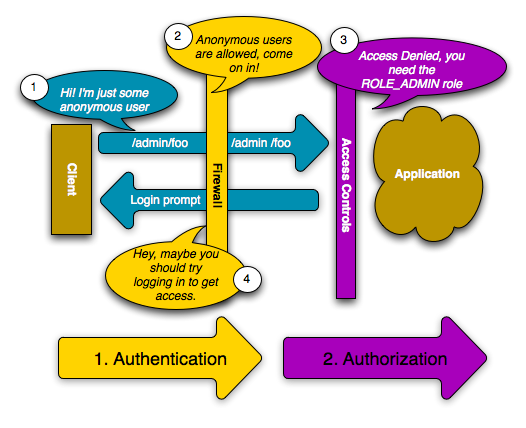 However, as soon as the access control layer denies the user access (because the anonymous user doesn't have the ROLE_ADMIN role), the firewall jumps into action and initiates the authentication process. 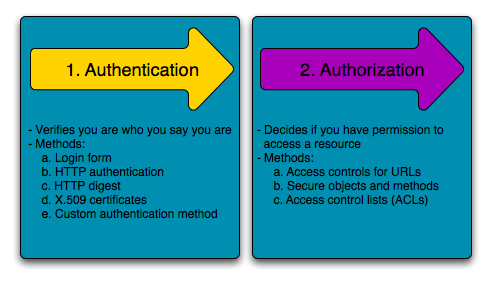 The authentication process depends on the authentication mechanism you're using. For example, if you're using the form login authentication method, the user will be redirected to the login page. If you're using HTTP authentication, the user will be sent an HTTP 401 response so that the user sees the username and password box. The user now has the opportunity to submit its credentials back to the application. If the credentials are valid, the original request can be re-tried. In this example, the user ryan successfully authenticates with the firewall. 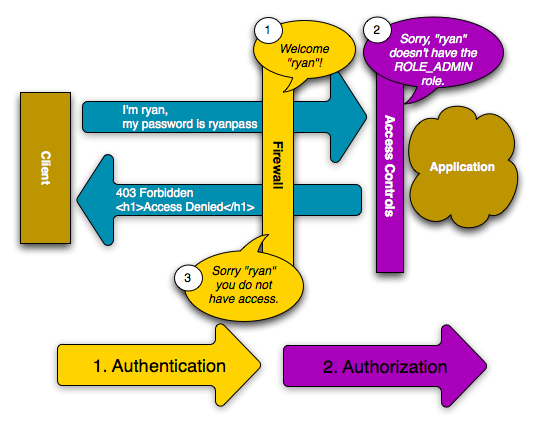 But since ryan doesn't have the ROLE_ADMIN role, they're still denied access to /admin/foo. Ultimately, this means that the user will see some sort of message indicating that access has been denied. When Symfony denies the user access, the user sees an error screen and receives a 403 HTTP status code (Forbidden). You can customize the access denied error screen by following the directions in the Error Pages cookbook entry to customize the 403 error page. The authenticated user re-tries the original request. The exact process actually depends a little bit on which authentication mechanism you're using. For example, when using form login, the user submits its credentials to one URL that processes the form (e.g. /login_check) and then is redirected back to the originally requested URL (e.g. /admin/foo). But with HTTP authentication, the user submits its credentials directly to the original URL (e.g. /admin/foo) and then the page is returned to the user in that same request (i.e. no redirect). These types of idiosyncrasies shouldn't cause you any problems, but they're good to keep in mind. You'll also learn later how anything can be secured in Symfony2, including specific controllers, objects, or even PHP methods. In this section, you'll learn how to create a basic login form that continues to use the hard-coded users that are defined in the security.yml file. To load users from the database, please read How to load Security Users from the Database (the Entity Provider). By reading that article and this section, you can create a full login form system that loads users from the database. So far, you've seen how to blanket your application beneath a firewall and then protect access to certain areas with roles. By using HTTP Authentication, you can effortlessly tap into the native username/password box offered by all browsers. However, Symfony supports many authentication mechanisms out of the box. For details on all of them, see the Security Configuration Reference. In this section, you'll enhance this process by allowing the user to authenticate via a traditional HTML login form. You will not need to implement a controller for the /login_check URL as the firewall will automatically catch and process any form submitted to this URL. New in version 2.1: As of Symfony 2.1, you must have routes configured for your login_path and check_path. These keys can be route names (as shown in this example) or URLs that have routes configured for them. Notice that the name of the login route matches the login_path config value, as that's where the security system will redirect users that need to login. Don't let this controller confuse you. As you'll see in a moment, when the user submits the form, the security system automatically handles the form submission for you. If the user had submitted an invalid username or password, this controller reads the form submission error from the security system so that it can be displayed back to the user. In other words, your job is to display the login form and any login errors that may have occurred, but the security system itself takes care of checking the submitted username and password and authenticating the user. The error variable passed into the template is an instance of AuthenticationException. It may contain more information - or even sensitive information - about the authentication failure, so use it wisely! The form has very few requirements. First, by submitting the form to /login_check (via the login_check route), the security system will intercept the form submission and process the form for you automatically. Second, the security system expects the submitted fields to be called _username and _password (these field names can be configured). And that's it! When you submit the form, the security system will automatically check the user's credentials and either authenticate the user or send the user back to the login form where the error can be displayed. The security system intercepts the request, checks the user's submitted credentials, authenticates the user if they are correct, and sends the user back to the login form if they are not. By default, if the submitted credentials are correct, the user will be redirected to the original page that was requested (e.g. /admin/foo). If the user originally went straight to the login page, he'll be redirected to the homepage. This can be highly customized, allowing you to, for example, redirect the user to a specific URL. For more details on this and how to customize the form login process in general, see How to customize your Form Login. When setting up your login form, watch out for a few common pitfalls. First, be sure that you've defined the login and login_check routes correctly and that they correspond to the login_path and check_path config values. A misconfiguration here can mean that you're redirected to a 404 page instead of the login page, or that submitting the login form does nothing (you just see the login form over and over again). Next, make sure that your check_path URL (e.g. /login_check) is behind the firewall you're using for your form login (in this example, the single firewall matches all URLs, including /login_check). If /login_check doesn't match any firewall, you'll receive a Unable to find the controller for path "/login_check" exception. If you're using multiple firewalls and you authenticate against one firewall, you will not be authenticated against any other firewalls automatically. Different firewalls are like different security systems. To do this you have to explicitly specify the same Firewall Context for different firewalls. But usually for most applications, having one main firewall is enough. The first step in security is always authentication. Once the user has been authenticated, authorization begins. Authorization provides a standard and powerful way to decide if a user can access any resource (a URL, a model object, a method call, ...). This works by assigning specific roles to each user, and then requiring different roles for different resources. A resource requires a specific role in order to be accessed. In this section, you'll focus on how to secure different resources (e.g. URLs, method calls, etc) with different roles. Later, you'll learn more about how roles are created and assigned to users. The most basic way to secure part of your application is to secure an entire URL pattern. You've seen this already in the first example of this chapter, where anything matching the regular expression pattern ^/admin requires the ROLE_ADMIN role. You can define as many URL patterns as you need - each is a regular expression. Prepending the path with ^ ensures that only URLs beginning with the pattern are matched. For example, a path of simply /admin (without the ^) would correctly match /admin/foo but would also match URLs like /foo/admin. For each incoming request, Symfony2 checks each access_control entry to find one that matches the current request. As soon as it finds a matching access_control entry, it stops - only the first matching access_control is used to enforce access. URI IP HOST METHOD access_control Why? Certain situations may arise when you may need to restrict access to a given path based on IP. This is particularly relevant in the case of Edge Side Includes (ESI), for example. When ESI is enabled, it's recommended to secure access to ESI URLs. Indeed, some ESI may contain some private content like the current logged in user's information. To prevent any direct access to these resources from a web browser (by guessing the ESI URL pattern), the ESI route must be secured to be only visible from the trusted reverse proxy cache. As you'll read in the explanation below the example, the ip option does not restrict to a specific IP address. Instead, using the ip key means that the access_control entry will only match this IP address, and users accessing it from a different IP address will continue down the acces_control list. 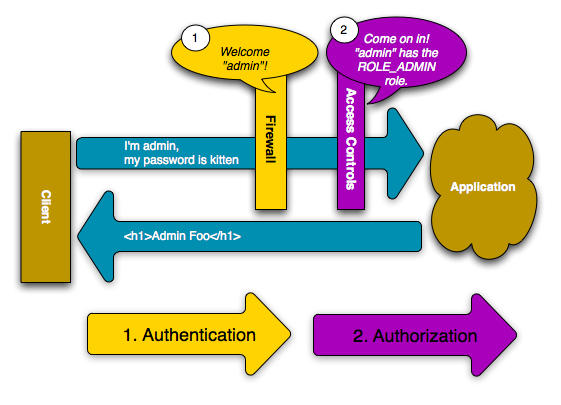 The second access control rule is enabled (the only restriction being the path and it matches): as the user cannot have the ROLE_NO_ACCESS role as it's not defined, access is denied (the ROLE_NO_ACCESS role can be anything that does not match an existing role, it just serves as a trick to always deny access). For more information, see the JMSSecurityExtraBundle documentation. If you're using Symfony's Standard Distribution, this bundle is available by default. If not, you can easily download and install it. In fact, anything in Symfony can be protected using a strategy similar to the one seen in the previous section. For example, suppose you have a service (i.e. a PHP class) whose job is to send emails from one user to another. You can restrict use of this class - no matter where it's being used from - to users that have a specific role. For more information on how you can use the Security component to secure different services and methods in your application, see How to secure any Service or Method in your Application. Imagine you are designing a blog system where your users can comment on your posts. Now, you want a user to be able to edit their own comments, but not those of other users. Also, as the admin user, you yourself want to be able to edit all comments. The Security component comes with an optional access control list (ACL) system that you can use when you need to control access to individual instances of an object in your system. Without ACL, you can secure your system so that only certain users can edit blog comments in general. But with ACL, you can restrict or allow access on a comment-by-comment basis. For more information, see the cookbook article: How to use Access Control Lists (ACLs). In the previous sections, you learned how you can protect different resources by requiring a set of roles for a resource. 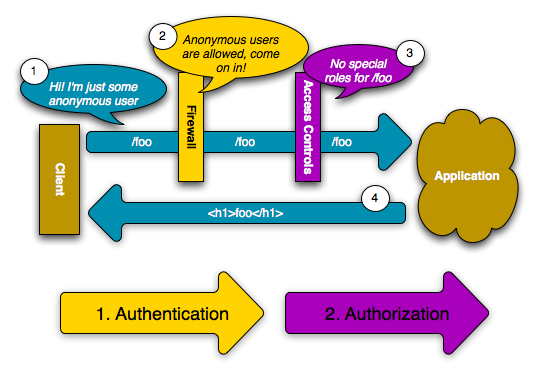 This section explores the other side of authorization: users. During authentication, the user submits a set of credentials (usually a username and password). The job of the authentication system is to match those credentials against some pool of users. So where does this list of users come from? In Symfony2, users can come from anywhere - a configuration file, a database table, a web service, or anything else you can dream up. Anything that provides one or more users to the authentication system is known as a "user provider". Symfony2 comes standard with the two most common user providers: one that loads users from a configuration file and one that loads users from a database table. The easiest way to specify your users is directly in a configuration file. In fact, you've seen this already in the example in this chapter. This user provider is called the "in-memory" user provider, since the users aren't stored anywhere in a database. The actual user object is provided by Symfony (User). Any user provider can load users directly from configuration by specifying the users configuration parameter and listing the users beneath it. For smaller sites, this method is quick and easy to setup. For more complex systems, you'll want to load your users from the database. If you'd like to load your users via the Doctrine ORM, you can easily do this by creating a User class and configuring the entity provider. A high-quality open source bundle is available that allows your users to be stored via the Doctrine ORM or ODM. Read more about the FOSUserBundle on GitHub. With this approach, you'll first create your own User class, which will be stored in the database. As far as the security system is concerned, the only requirement for your custom user class is that it implements the UserInterface interface. This means that your concept of a "user" can be anything, as long as it implements this interface. With the introduction of this new provider, the authentication system will attempt to load a User object from the database by using the username field of that class. This example is just meant to show you the basic idea behind the entity provider. For a full working example, see How to load Security Users from the Database (the Entity Provider). For more information on creating your own custom provider (e.g. if you needed to load users via a web service), see How to create a custom User Provider. New in version 2.2: The BCrypt encoder was introduced in Symfony 2.2. You can now calculate the hashed password either programmatically (e.g. password_hash('ryanpass', PASSWORD_BCRYPT, array('cost' => 12));) or via some online tool. Supported algorithms for this method depend on your PHP version. A full list is available by calling the PHP function hash_algos. New in version 2.2: As of Symfony 2.2 you can also use the PBKDF2 password encoder. In order for this to work, just make sure that you have the encoder for your user class (e.g. Acme\UserBundle\Entity\User) configured under the encoders key in app/config/security.yml. When you allow a user to submit a plaintext password (e.g. registration form, change password form), you must have validation that guarantees that the password is 4096 characters or less. Read more details in How to implement a simple Registration Form. Anonymous users are technically authenticated, meaning that the isAuthenticated() method of an anonymous user object will return true. To check if your user is actually authenticated, check for the IS_AUTHENTICATED_FULLY role. The idea of a "role" is key to the authorization process. Each user is assigned a set of roles and then each resource requires one or more roles. If the user has the required roles, access is granted. Otherwise access is denied. Roles are pretty simple, and are basically strings that you can invent and use as needed (though roles are objects internally). For example, if you need to start limiting access to the blog admin section of your website, you could protect that section using a ROLE_BLOG_ADMIN role. This role doesn't need to be defined anywhere - you can just start using it. All roles must begin with the ROLE_ prefix to be managed by Symfony2. If you define your own roles with a dedicated Role class (more advanced), don't use the ROLE_ prefix. As of Symfony 2.1, you must have a route that corresponds to your logout path. Without this route, logging out will not work. Once the user has been logged out, they will be redirected to whatever path is defined by the target parameter above (e.g. the homepage). For more information on configuring the logout, see the Security Configuration Reference. If you use this function and are not at a URL where there is a firewall active, an exception will be thrown. Again, it's almost always a good idea to have a main firewall that covers all URLs (as has been shown in this chapter). A firewall must be active or an exception will be thrown when the isGranted method is called. See the note above about templates for more details. If you use a form login, Symfony2 will create a cookie even if you set stateless to true. The Symfony Security component comes with a collection of nice utilities related to security. These utilities are used by Symfony, but you should also use them if you want to solve the problem they address. The time it takes to compare two strings depends on their differences. This can be used by an attacker when the two strings represent a password for instance; it is known as a Timing attack. // is password1 equals to password2? The nextBytes() methods returns a random string composed of the number of characters passed as an argument (10 in the above example). You can also access a secure random instance directly from the Symfony dependency injection container; its name is security.secure_random. Security can be a deep and complex issue to solve correctly in your application. Fortunately, Symfony's Security component follows a well-proven security model based around authentication and authorization. Authentication, which always happens first, is handled by a firewall whose job is to determine the identity of the user through several different methods (e.g. HTTP authentication, login form, etc). In the cookbook, you'll find examples of other methods for handling authentication, including how to implement a "remember me" cookie functionality. Once a user is authenticated, the authorization layer can determine whether or not the user should have access to a specific resource. Most commonly, roles are applied to URLs, classes or methods and if the current user doesn't have that role, access is denied. The authorization layer, however, is much deeper, and follows a system of "voting" so that multiple parties can determine if the current user should have access to a given resource. Find out more about this and other topics in the cookbook.